In order to define what true gossip is we first need to talk about what it cannot be. One modern definition goes like this, “Gossip is talking about someone behind their back.” Really? Because, if we’re really going to adopt this definition we will essentially have to likewise accuse the Apostles and our Lord of this very act. In fact, I don’t know how we’d even function as a society if everyone were to adopt this? How many necessary tasks require us to talk about someone when they’re not around, including details that may not be the most flattering? Anyone who’s ever been in management of any kind can especially relate to this. Let’s look a few biblical examples of this before moving forward. It is obvious from the character of the letter that Paul’s purpose in using this particular story was to educate the Galatians on the relationship between the law and grace, yet look how he does it! Was Paul a “gossip” for including in his letter an example of the hypocrisy Cephas (Peter) had partaken in? Paul is known for calling people out in his letters. In our day and age these things would be considered extremely harsh and intolerant, no doubt candidate examples for gossip’s poster children. Consider these illustrations from the man who wrote and developed Christian theology more than any other individual. There is no doubt Paul would have been accused of heinous gossip and intolerance if such events took place in our own day. Yet consider this. Paul, while describing the depths of depravity man will commit when left to himself, along with such sins as “murder” and “deceit” uses the word “Psithuristes,” a word translated, “gossips.” “Psithuristes” can be defined as “a whisperer, secret slanderer, detractor.” So Paul was against gossip! 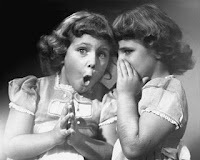 Therefore, gossip must be more than simply sharing unflattering information about someone. Likewise, it must also be more than simply sharing information about someone behind their back or when they’re not around. How else would the apostle Paul have even heard about some of the personal situations he wrote against when he was not present to observe them first hand? Obviously, a witness must have brought him this information. In Matthew 18:15-17 Jesus instructs on the steps for “church discipline” as it’s sometimes called. It should be noted that there must be some kind of conversation taking place between the initial confronter and those in the church who jointly confront during the second step. This means that something negative is shared behind someones back for the purpose of restoring them to a right relationship with God. In the last step this negative information is given to the rest of the church, again so that the brother can be won back. In light of both the example of the Apostle Paul and Jesus, I believe it would be helpful for us to shed our bumper sticker conceptions of gossip and start afresh a search for a new and true definition.